Glenn Maxwell’s incredible match-winning ton in India yesterday may have dominated headlines but in the background, Peter Handscomb’s new role as T20 wicketkeeper could boost Australia’s World Cup hopes. 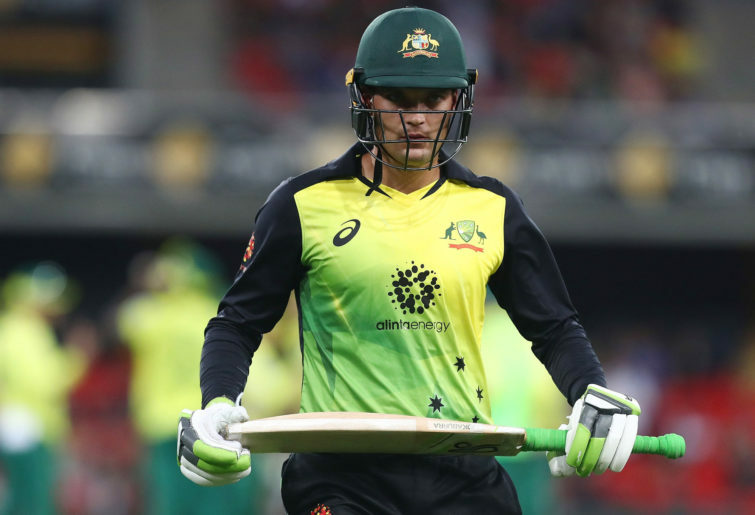 Handscomb’s leapfrogging of T20 vice-captain Alex Carey – a major move by the selectors – suggests the Victorian is now in the frame to keep at the ODI World Cup in England in June. I have long been a fan of the idea of handing the gloves to Handscomb, who has piled up 1,045 at an average of 48 when playing as a wicketkeeper in List A cricket. By comparison, Carey averages just 28 across his List A career and has no suitable role within the Australian ODI batting line-up. Yet this sudden switch by the selectors caught me off guard. I had assumed Carey’s leadership status meant he was locked in to don the gloves in that massive tournament. I’ll come back to this issue in a moment, but first to that astonishing knock from Maxwell. As I noted in a recent piece for The Roar, Maxwell has become a wonderfully-consistent T20 batsman. Since making a match-winning 75 from 43 balls in South Africa three years ago – his breakthrough T20 knock – Maxwell’s been a wrecking ball in T20Is, piling up 1,106 runs at 50, all while scoring at a scorching strike rate of 159. His 113no from 55 balls against India yesterday was his third ton in his past 25 T20s. It was also the second match in a row where he formed the backbone of the Australian innings and led them to a surprise victory over the mighty Indians. In the first ODI on Sunday Australia were in trouble at 2-5 when Maxwell came to the crease, calmly compiled 56 from 42 balls and set up the victory. His knock yesterday was altogether more spectacular, one of the greatest innings in T20 history. By the time Maxwell faced his first ball, Australia were 2-23 and looked to be gone. They needed 168 runs from 15.3 overs, with opener D’Arcy Short struggling to get going at the other end on 8* from 9 balls. Maxwell took the matter out of Short’s hands by storming to 50 from 26 balls. Then when Short departed for a handy 40 from 28 balls, Maxwell’s dynamic brilliance released the pressure on Handscomb, who was able to focus solely on getting his partner on strike. Forget about Australians struggling against spin, Maxwell butchered one of the world’s star T20 spinners in Yuzvendra Chahal. The Indian leggie entered this match with the fantastic career figures of 46 wickets at 20 in this international format only to be hammered for 0-47 from his four overs, including three sixes and two fours by Maxwell. In the process, Maxwell engineered India’s first-ever series loss at home under the captaincy of Virat Kohli – across all formats and from no less than 16 series. Now back to Handscomb and his appeal as an ODI wicketkeeper. The 27-year-old is not in the same league with the gloves as Carey, that is undeniable. But he did play as a ‘keeper in underage cricket, entered the Victorian setup as a gloveman and as a professional has kept in more than 50 matches across all formats. Handscomb has been solid with the gloves for Victoria in 50-over cricket, does a good job behind the stumps in the BBL, and has not looked out of place during the five white ball matches in which he’s kept for Australia. Most importantly, he has the potential to significantly improve the balance of Australia’s misfiring batting line-up, while Carey has been one of the reasons that it has lacked balance. Carey simply does not fit in to the Australian batting line-up. He has played most of his List A cricket as an opening batsman but is not suited to opening for Australia for two reasons. Firstly, Australia already has a logjam of opening options in ODIs, with their captain Aaron Finch being an opener, their best batsman David Warner also an opener, and the likes of Usman Khawaja, D’Arcy Short and Travis Head all vying strongly to face the new ball. Secondly, Carey just scores too slowly. To compete with high-scoring ODI teams like England and India, Australia must begin regularly making and chasing scores of 330-plus. To do so they need to be making good use of the first Power Play when the field is up, the balls are hard and there is pace on the ball. Carey’s career List A strike rate of 76 – which is equal to his career ODI strike rate of 76 – translates to a scoring rate of just 4.56 runs per over. That strike rate dropped to 68 across the three times Carey has opened in ODIs. Put simply, he is an old-school opener more suited to ODI tactics of 20 years ago when teams were happier to build their innings slowly in preparation for a late onslaught. Carey also doesn’t have the power to bat down at seven and finish innings with a flurry. His best position in ODIs is probably as an accumulator batting at around 5 but he’s entirely unproven in such a role and doesn’t work the ones and twos nearly as well as Handscomb. It is this subtle skill which makes Handscomb so appealing to Australia’s ODI batting line-up. Australia have long lacked a solid middle-order batsman who does not rely on boundaries but instead builds his game on strike rotation. Handscomb is excellent at continually turning over the strike by piercing the gaps and running hard. This makes him a perfect foil for big hitters like Glenn Maxwell, Marcus Stoinis and David Warner who deal in fours and sixes. Handscomb remains inexperienced as an ODI cricketer but has begun to flourish at this level, making 207 runs at 41 from his past five matches, at the great strike rate of 107. Against the elite Indian ODI side last month he made a great impression with his busy middle order batting, showcasing a range of gears in his batting. In the first match he took on the Indian bowlers, clouting six fours and two sixes as he sprinted to 73 from 61 balls. Then in the final match he displayed his fine ability to rotate the strike, making 58 from 63 balls despite scoring just eight runs in boundaries. It is his ability to either bunker down in a crisis, to work the ones and twos as a foil for a hitter, or to go after the bowlers himself which makes him such a versatile and valuable ODI batsman. The only other ODI batsman Australia have in this mould is Steve Smith. Their ODI line-up would benefit from having two such adaptable players to complement their bevy of bludgeoners in the World Cup.